This introduction to the study of the Russian novel demonstrates how the form evolved from imitative beginnings to the point in the 1860s when it reached maturity and established itself as part of the European tradition. Professor Freeborn considers selected novels by Pushkin, Lermontov, Gogol, Dostoyevsky and Tolstoy. Extended introductory sections to the studies of Dostoyevsk and Tolstoy deal with their earlier works. A final chapter summarises the principal points of contrast between Crime and Punishment and War and Peace, and argues that in certain specific ways, they represent the peaks in the evolution of the form of the Russian novel. Quotations are translated, but key passages are also given in the original. 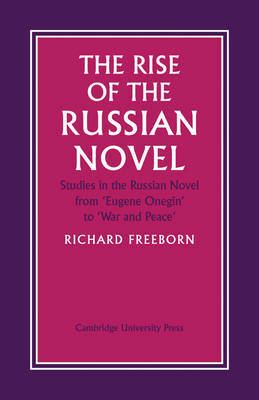 Professor Freeborn treats the novel as a literary form and avoids the overworked formulae on which much historical writing on Russian literature has been based. He is concerned with the literary development of a great form.